Tobermory, the “Tub”, lies at the tip of the Bruce Peninsula, where #6 Highway ends at the waters of Georgian Bay, (recently a woman from away drove down the boat ramp into the harbour following her GPS. She wasn’t hurt and her car got a complete wash – inside and out!). 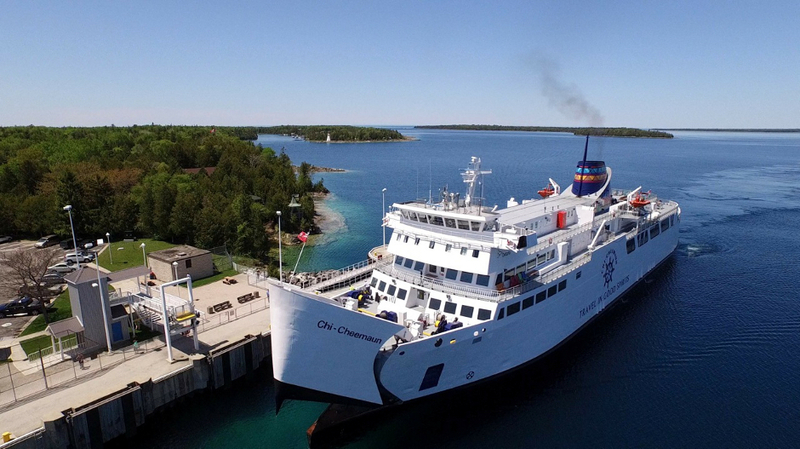 From its southern terminus here the Chi-Cheemaun ferry runs north to South Baymouth where the highway continues on again across Manitolin Island. Every year Tobermory holds the Chi-Cheemaun Festival to celebrate the return of summer. Its held in on the 3rd weekend in June, this year the 17th, 18th and 19th. This is a huge weekend event, with many attractions being held during this 3 day mid-June celebration, and along with an excellent car show, there are pancake breakfasts, barbeques, baseball tournaments, and hilarious cardboard boat races, held amongst the real “sea-going craft” right in Little Tub harbour. The O.P.P., R.C.M.P., and Canadian Coast Guard ships often attend in full regalia. The Festival’s car show car show officially starts at 1:00pm though cars arrive long before that. Spectators, enthusiasts, and cars are attracted from as far east as the Lake Simcoe area, from south of the 401 corridor, from the Golden Horseshoe, Southwestern Ontario and even Windsor, along with a lot of more local talent. It’s a hugely popular event and our Bruce/Grey Group has enthusiastically attended it for several years now, starting with breakfast further south on the Peninsula, then proceeding north in convoy to the Tub. For the uninitiated, Lion’s Head is still located 20 to 30 minutes north of Wiarton. For the scenic route, just north of Wiarton swing right off #6 Highway onto Bruce County road #9. For lovers of the Superslide, follow #6 north to Ferndale then turn right, or east, and follow County #9 to Lion’s Head. Join us if you like, you’ll not be disappointed … Rob Ockenden.